At the Star Kids Home, a combination group home/orphanage, a disparate group of children struggle with both the everyday issues of growing up and those specific to abandoned or orphaned children. Their one avenue of escape is the Sunny, a junked car that sits a little ways from the home. In the Sunny they can travel the world, go into space, or just find a refuge from the troubles of their world. Sunny won the 61st Shogakukan Manga Award in the general category in 2015 and the 20th Japan Media Arts Festival Excellence Prize Award in 2016. The manga was serialized in Ikki until the magazine's discontinuance on September 25, 2014 (November issue), and then transferred to Gekkan! Spirits on January 27, 2015 (March issue). The series has been published in English by VIZ Media under the SigIkki imprint in hardcover format since May 21, 2013 and in Spanish by ECC Comics since October 29, 2015. 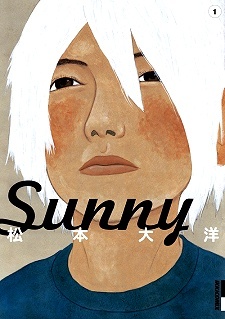 Sunny is based partly on author Taiyo Matsumoto's own childhood, during which he spent time in a children's home. This review contains spoilers, but they are minimal and should not detract from the experience of one who has not read Sunny. To the orphans of Star Kids home, the Sunny, a broken down car, is their ray of hope. Unsure of whether they'll ever return to their families, these kids rely on their imagination to give them consolation. Taiyou Matsumoto captures the hardships of the many children at Star Kids home, each with their own ways of coping with their lives. White-haired Haruo uses the Sunny to escape into a fantasy where he's an outlaw on the run, mirroring his tendency to rebel to cope with his feelings of isolation. Sei, the bookworm, imagines driving in the Sunny towards his home and meeting up with his parents. He keeps his feelings dormant, clinging to his hope that his parents will return for him, even though time and time again, they don't. The kids find their unique ways of maintain hope. Junsuke, for example, clings to his umbrella at all times, affirming that it is his house and helps his little brother look for four-leaf clovers for their mother. The stories of these children are saddening but how they cope with their situations is beautiful. Matsumoto does a fantastic job with the web of relationships between the members of the orphanage. He aptly portrays how the kids affect each other's actions and beliefs and how they differ in their perception of the other orphans. Even the seemingly selfish Haruo can show signs of empathy when his friends are insecure. The bond between the orphans is very strong, whether they admit to it or not. Although they show signs of quarreling, these children are able to keep going in life thanks to the friendships they form. They want to leave the orphanage and return to their families, yet cannot bear to see their friends leave them. Ultimately, the children behave like children, with their own mood swings, moments sympathy and selfishness, and their drive to live a satisfying life amidst their hardships. The parents have their own reasons and regrets for leaving their children, and Matsumoto poignantly captures the personal, bittersweet meetings of the children with their parents. Both the children and the parents cherish the moments they can spend time with each other but knowing that they have to eventually part ways again, they're unable to fully enjoy these reunions. Some meetings tear apart the relationships between the children and their parents, but the parents still seek to keep in touch even when the children seemed to have abandoned them. Many of these parents have admirable intentions but are constrained by their conditions, whether it be alcohol addiction, divorce, or poverty. The circumstances of life are not ideal, but each character has to move forward. Matsumoto sticks close to reality with this manga, drawing upon his own experiences as an orphan to the point that he feared the characers in his story were too similar to real people in his life. This inspiration from reality definitely shows, as Sunny is able to maintain its realism from beginning to end. Sunny's artwork is peculiar but has a purpose. The cluttered artwork effectively captures the messiness of life apparent throughout the manga. Sunny is a work best experienced rather than analyzed and one that demonstrates the beauty that can be found in a harsh life. The ending of Sunny leaves the reader wishing for more, unable to fully depart from this beautiful story, and this itself is a parallel to how the orphans feel when their friends must depart. Storyline is slice of life with different chapters focussing on different characters. It's an easy series to read and keeps you absorbed. Nothing that left a particularly strong impression on me though. Maybe because I'm from a different generation to the one it depicts. I only read it last year but couldn't remember what it was about until I re-read the synopsis on MAL and that brought back bits and pieces of the story back to me. I suppose the characters didn't resonate with me, and I didn't identify myself in any of them so I was detached. Anyway, still think it's worth checking out if just for the artwork. Taiyo Matsumoto, the guy behind Tekkon Kinkreet has a unique style which sets his work apart from typical manga.